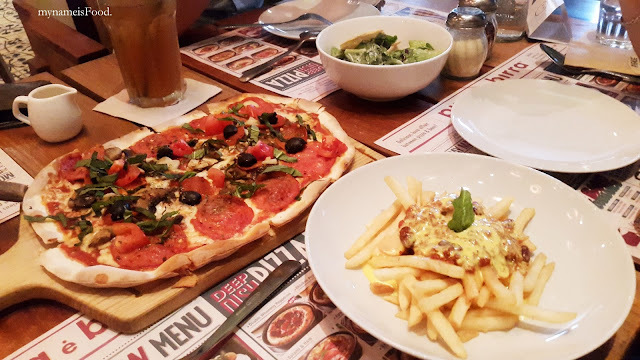 Pizza e Birra, Plaza Indonesia, Jakarta, Indonesia - my name is Food. 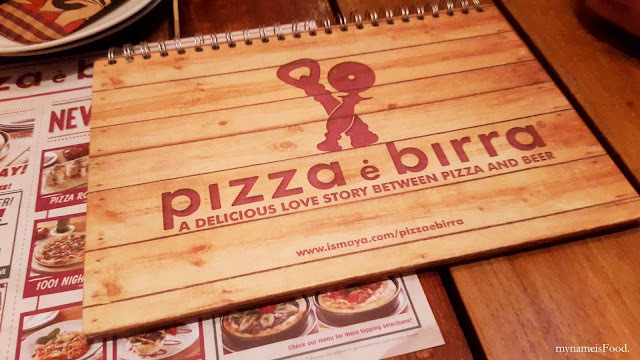 Pizza e Birra is a casual and relaxing dining eatery serving gourmet pizzas and popular classic comfort food. 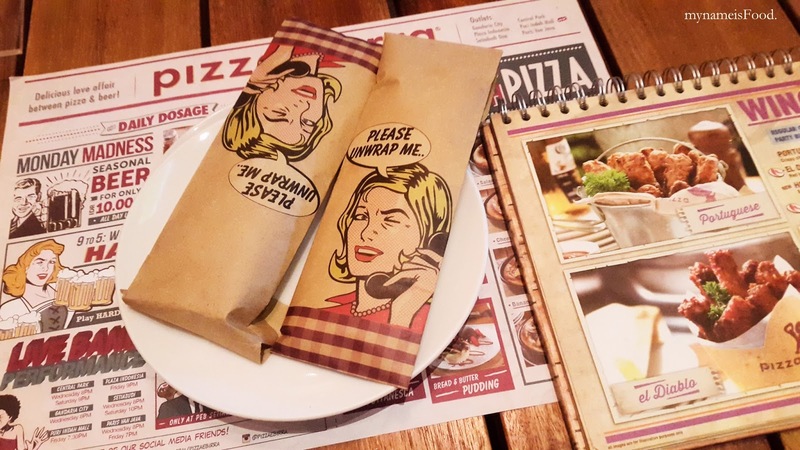 Having both traditional Italian and non Italian, it will allow everyone to have a try at different pizzas and suit your tastebuds.. If you wanna have a few drinks, then go ahead, their beer selection is not too bad so whether it may be your lunch break or meeting up with friends, this place is sure to be a casual but fun dining area for you guys. 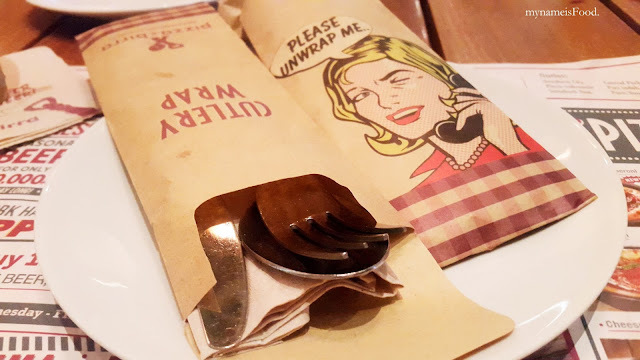 A plate with a cartoon printed paper wrap where you have to open to reveal your cutleries and serviettes. 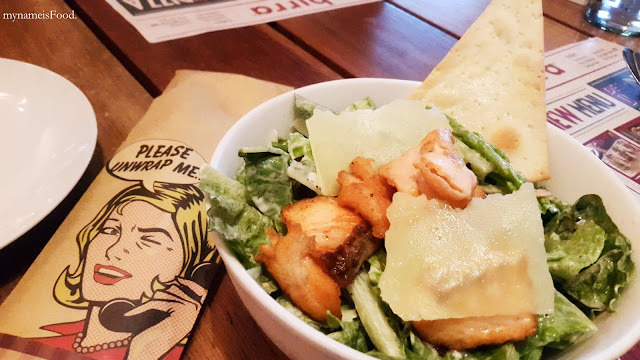 Started off with 'House Caesar Salad with Chicken' (IDR43rb - AUD$4.3 plus chicken IDR30rb - AUD$3), the salad itself does not come with any meats but you may add either chicken or salmon on top for extra. 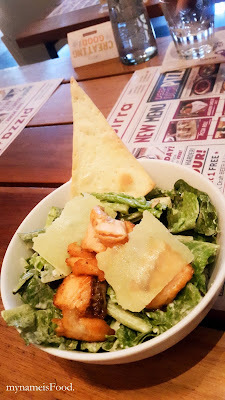 Sometimes Caesar Salads are great the way it is but I found that the Caesar salad here is somewhat nicer with extra meat.. The Iceberg lettuce were cut roughly though I always wonder, I think a smaller rough cut would be nice, sometimes the cuts are just quite big and hard to bite on. The caesar sauce was quite light so some may like it, some may not, I prefer my Caesar sauce to be more flavoursome and slightly more. 'Callabrese Thin Crust Pizza' (IDR83rb - AUD$8.3) consists of a medley of Italian hunter style fresh ingredients of pepperoni, salami, roasted garlic, black olives, mushroom, tomato and fresh basil.. 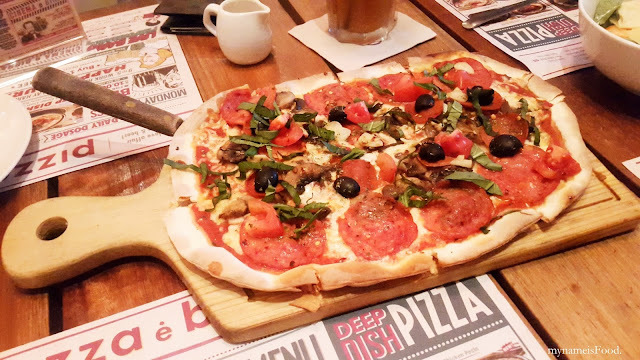 This place has deep pan and classic pizzas too which a deeper and thicker crust but have different toppings and flavours on offer. 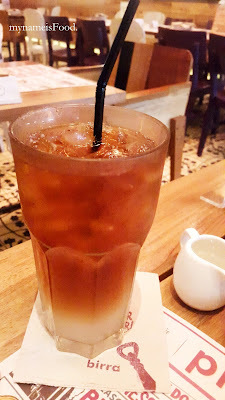 Seeing that they have more than 10 choices, it will make you rethink your choices after saying you want this one... then seeing the other choices, then change your mind again.. just maybe. 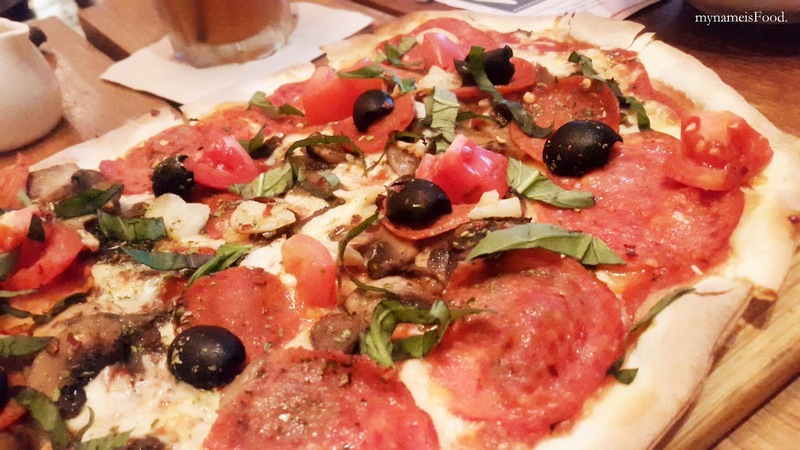 The thin crust was nicely done, though I would have preferred not as thin. The combination of the toppings were well done, though I found that the tomato sauce was abit bland. But overall, the pizza was nice. 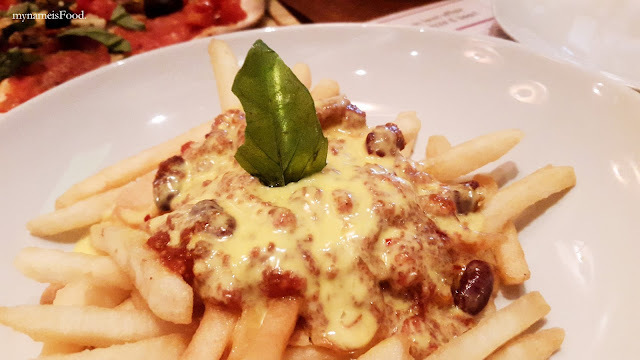 'Chilli Con Carne Classic Original French Fries' (IDR52rb - AUD$5.2) was a nice side dish to have but I was quite dissapointed with the portion and also its huge difference with the photo on their menu. 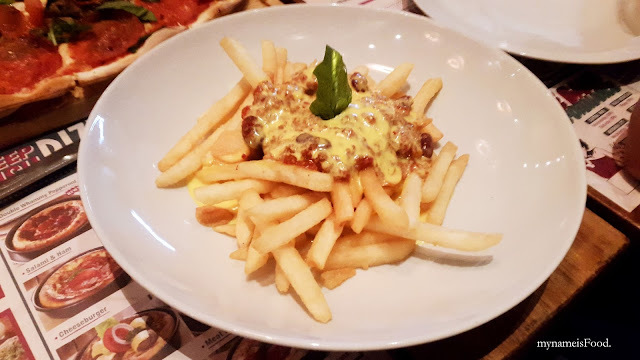 On their menu, it looked so cheesy and meaty with crunchy french fries, but what came out seemed to be just a not so well deep fried fries as it wasn't as crispy, and also the chilli con carne had a hint of spice but it just was not enough for the whole dish. The chilli con carne had a bit of meat and some kidney beans, the cheese was already on top of the chilli con carne, but overall, it did not bring out as much flavour as I had hoped it would. It was not enough overall as the cheese and chilli con carne was quite limited for the fries. Though through all the mixed feelings over the food, I would come back and try their other pizzas and the other dishes they have on offer..